Foundation cracks come in many varieties, but all could be indicators of a problem with your foundation. 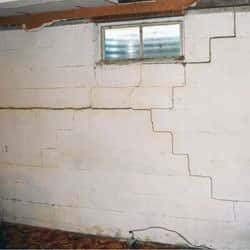 If you have horizontal or vertical wall cracks, "stair-step" or diagonal cracking, bulging, buckling foundation walls, or pushing in at the bottom or top of the wall, you could need foundation repair. Foundation wall cracks have several different causes, and each has its own unique solution. Concrete walls may experience small cracks as they cure. These are normal and may be no cause for alarm. However, walls cracking due to foundation settlement issues or expansive soils may require some repair work. Total Foundation Solutions are your local experts for all your foundation repair needs in Pennsylvania and New York. We have warrantied solutions that fix foundation wall cracks! Call us for a foundation inspection and free foundation repair quote today! We serve Warren, Erie, Edinboro and many nearby areas. Stair step cracks are a very common problem and a likely sign of foundation settlement. 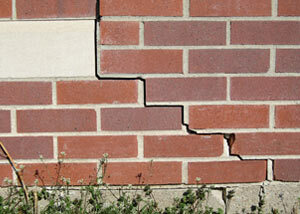 Foundation cracks vary in severity from a simple cosmetic issue to a major structural problem with your home. However, even serious foundation problems, when addressed early on, can be quickly and permanently fixed. As concrete cures, it is common for small cracks to appear in foundation walls. These cracks are very common, and they're not a sign of a major foundation problem. 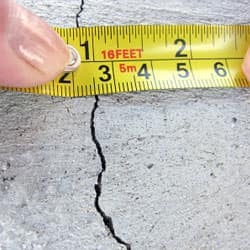 Shrinkage cracks tend to be very small "hairline" cracks that are usually 1/16" wide or less. They generally occur near the center of a span and maintain a consistent width for the length of the crack. A word of warning: Be careful not to assume that a crack in your foundation is merely a shrinkage crack! If you see cracks in your foundation walls, monitor them regularly. If the cracks widen enough that you can fit a dime in them, or one end of the crack grows wider than the other, you should call us right away. When the soils underneath your foundation fail to support the weight of your home, the foundation will begin to settle unevenly, and cracks will appear. 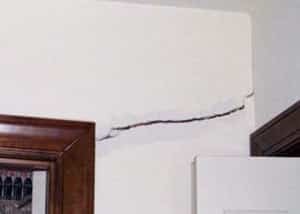 As vertical cracks form and the wall or corner of the house begins to rotate, you will typically see cracks that are wider at the top or bottom. Foundation cracks that are caused by settlement are very serious, and they will only get worse over time as the home continues to move. If you are concerned that your foundation may be cracking due to settlement issues, it's best to address the problem as soon as possible. If you have clay soils around your home, they can expand and contract significantly as they become wet. Wet clay soils can expand enough to put literally thousands of pounds of pressure on a foundation wall. This can force the walls inwards, sometimes causing them to buckle and crack. Look also for walls pushing in at the bottom or tilting in at the top. If left unrepaired, this kind of damage can worsen until the wall fails completely or is beyond repair. By addressing the problem of failing walls quickly, repairs can be completed in as little as a day. Whether the problem is expansive soils or unstable soils underneath your foundation, there are effective solutions that can permanently repair your foundation or structure. Foundation pier systems are an excellent way to stabilize and potentially lift a foundation that is resting on soils that cannot support the weight of the home. Foundation piers are a permanent solution for homes that are settling, and they can be installed year-round. Push piers stabilize foundations by transferring the weight of the home deep below the foundation, reaching to bedrock or competent strata. Helical piers are an excellent way to stabilize foundations when there is sufficient knowledge of local soil conditions. They are advanced into the soils underneath the foundation via a helical blade. Wall anchor systems, like our Geo-Lock™ Wall Anchor System, are ideal for stabilizing and potentially straightening foundation walls that are buckling due to pressure from expansive soils. Wall anchors use the soils beyond the foundation walls to exert counterpressure on failing foundation walls. This holds the walls in place in the short term, and it allows your contractor to attempt to straighten the walls back to their original position over time. 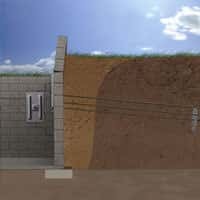 This solution requires access to the soils beyond your foundation walls. If exterior access is limited or not possible, we recommend installing the PowerBrace™ Wall Repair System as an effective solution. Can I have a settlement issue if my foundation walls aren't cracked? 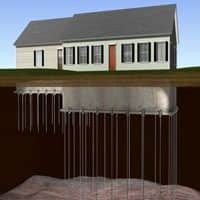 Crawl spaces can sag when the support beams sink into the ground. They can also sink when mold and rot weaken floor joists and girders, or when too few crawl space support posts are in place to adequately support the structure bearing down from above them. As crawl spaces sag, the floor above will also sink. As the floor sinks, it can pull on the partition walls attached to it, leading to drywall cracks. We can repair sagging crawl spaces with effective support posts. When the soils underneath slab floors settle or are washed away, the floor itself will begin to sag. Likewise, when the soils underneath a concrete floor expand, the slab will begin to lift upwards. Either way, the movement of concrete floors can lead to cracks along drywall and the floor itself. We can help your repair concrete floors that are sinking or heaving. Cracks on interior walls can be a sign of a sagging crawl space rather than a settling foundation. No matter what kinds of problems you're experiencing with your foundation walls, our in-house team of foundation experts is here to help. At Total Foundation Solutions, we repair foundations throughout Pennsylvania and New York every day. We'd like to offer you a free, no obligation foundation wall repair quote to help you decide what repair solution is best for your home. Each of our free quotes comes at no obligation and includes an on-site inspection, a personal consultation, and a written estimate. To schedule your free quote, call or e-mail us today! We serve Edinboro, Erie, Warren, Meadville, Fredonia, Jamestown, Olean, Du Bois, Harborcreek, Hermitage, and many areas nearby.